This type of porcelain was made in the period c. 1680-1725, during the reign of Emperor Kangxi (1662-1722), when many new inventions were made, the export was gaining momentum and and production in the porcelain kilns in Jingdezhen was at its height. As a new, modern type of ware, famille verte enjoyed a widespread appeal and was occurred on the domestic Chinese market as well as for export to Europe. Famille verte wares are extraordinarily fine and beautiful objects. The colorful decorations of flowers, butterflies, mythical animals or Chinese figural scenes are rendered in painstaking detail yet vital, lively and in a fresh manner that later porcelain lacks. Nowadays, famille verte can be found in museums, country houses, palaces and private collections all over Europe and the USA. In the Netherlands, too, it constitutes a substantial part of several museum collections of Chinese ceramics, e.g., the Rijksmuseum Amsterdam, the Municipal Museum in The Hague, the Boymans van Beuningen Museum in Rotterdam, the Groninger Museum in Groningen, and the Princessehof Museum in Leeuwarden. Notwithstanding its high quality, its beauty and its ongoing appeal, famille verte has never been the subject of a monograph or exhibition in the West or in China before. 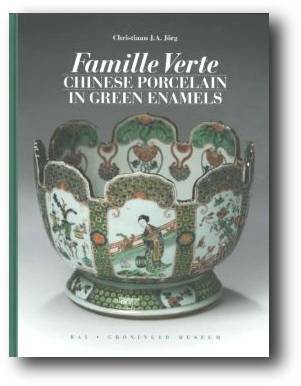 This publication appeared on the occasion of the exhibition Famille Verte – Chinese Porcelain in Green Enamels in 2011-2012 at the Groninger Museum. The more than 175 objects in the exhibition were chosen for their wealth of shapes and decorations; at the same time they constitute a concise survey of the rich holdings of famille verte in Dutch public collections.